Cette excursion de deux heures est idéale pour les croisiéristes qui souhaitent profiter au maximum du temps limité à Akaroa. Votre autocar climatisé viendra vous chercher au quai d’Akaroa et vous emmènera à certains des points forts de la ville. Traversez Takamatua, la baie Robinson, Davauchelles, Barry's Bay et montez jusqu'au Hill Top Tavern pour admirer la vue panoramique. Profitez d'une dégustation de fromage et de la possibilité d'acheter du vin et de la nourriture. We thoroughly enjoyed this tour. It was easy to find the tour company once we had been tendered to shore. We had an excellent driver who took us to several view points where we could see our cruise ship from the mountain. The scenery was beautiful. We would highly recommend this tour to anyone wanting to see the Akaroa in a short period of time. Thank you. This is a leisurely coach ride around the local area with a very knowledgeable driver. The scenery is stunning and the locals very friendly. 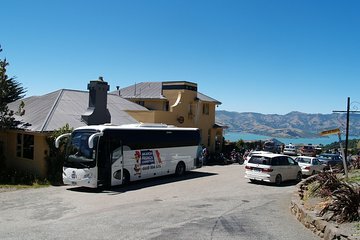 The 2 hour bus tour gave us amazing views of Akaroa town, the harbour and surrounding district. Our driver was a local who provided us with an excellent commentary throughout giving us a good understanding of the history of the area and what's happening there today. I would recommend this tour to all who visit Akaroa by ship. This tour started with a little hiccup as were originally early for our tour we were advised to take a look at the shops and to not hurry back to our tour starting time of 11.30am as the tour was waiting on a number of people to still arrive from the tenders from our cruise. So on the advise of the tour operator we arrived at 11.31 and found our bus leaving without us. We then had to wait for another 45 minutes for the tour to begin. The bus driver we did have was very knowledgeable and a safe especially on the hilly windy roads. The Hilltop Tavern whilst very picturesque was in state of transition and a state of disrepair. Not to cleanest of cafes with only 1 toilet for another of busloads to use at the sametime. Otherwise an enjoyable tour. Boat could not get straight into harbour so had to get a tender from boat to shore, that was something different but no problems at all. Akaroa is a stunning little fishing village, best fish and chips there. You have to try the Blue Cod which you can only get in the south island. YUM. So many shops to wander in and out of, markets. The bus driver was waiting for us when we got there, he was very knowledgeable, very friendly and very funny. Plenty of time to wander around and have a feed and a drink. Excellent. The young lady certainly knew all about Akaroa and the trip was excellent, could not wish for better. The tour was good, the scenery beautiful but the lunch break was to short and no time to order food. It Started well nice bus ride but when we got to the pub for lunch we were told not to order anything that needs to be cooked as they take to long, it was billed as a pub lunch then we went to the cheese factory to see how the cheese was made but staff where busy with tourist buses which all turned up at the same time causing mayhem for staff and customers. Bad day, all we saw was the inside of a cloud. But hey this sometimes happens, would do it again only on a fine day. Easy pick up at end of wharf. The day was overcast and drizzly but gnat didn't stop us going off to the tours of cheese factory and local pub. On return we had options of where to leave the tour. All local information was interesting and well presented. Easy villages to walk around.